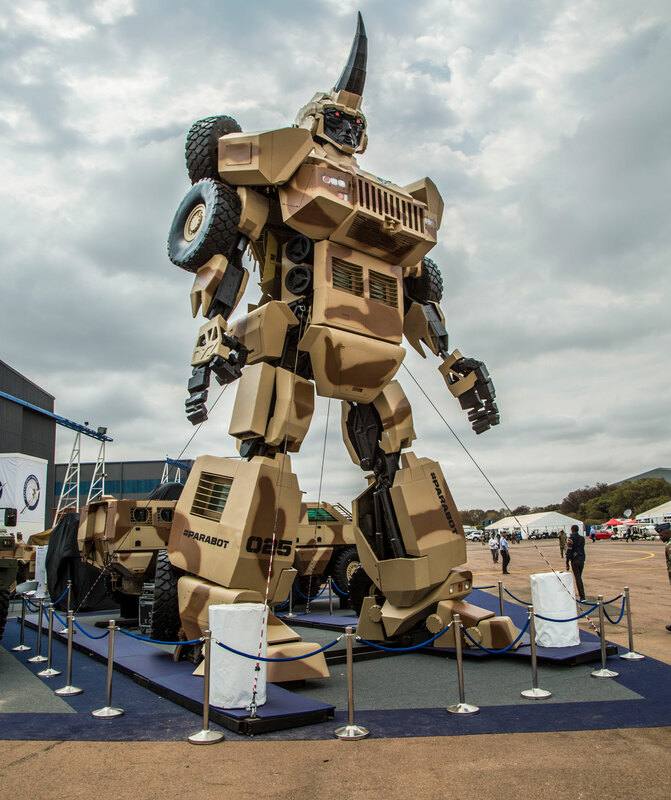 In 2014, when the Paramount Group – a global defence, internal security and peacekeeping industry leader – wanted a spectacular addition to their African Aerospace and Defence (AAD) Expo, they sought inspiration from the blockbuster Transformers movie franchise. They entrusted experienced exhibition designer Aidan Bennetts to develop what became known as the Parabot. The Parabot: a domineering zoomorphic figure that vividly captured the spirit of innovation that the company wanted to showcase at the bi-annual arms and technology conference. 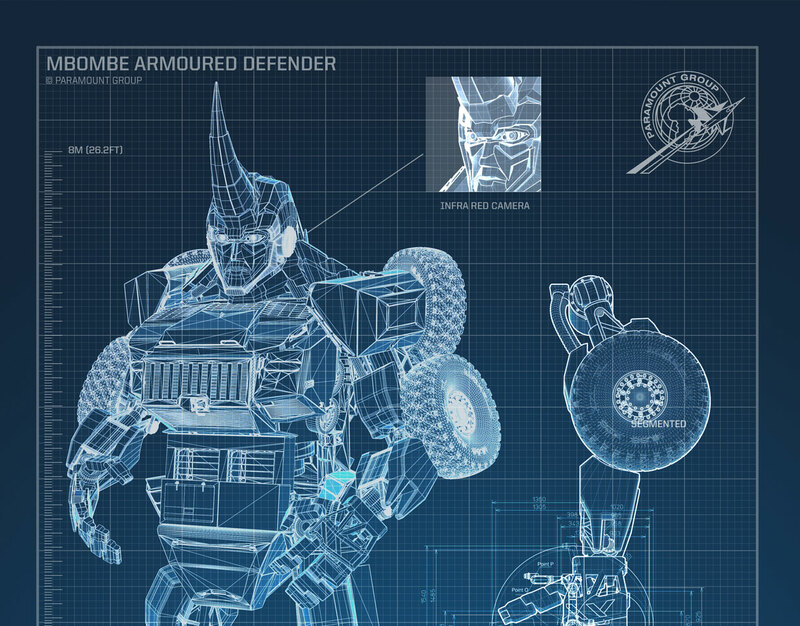 Basing his design on 3D software renderings of the ‘Mbombe 6 Armoured Defender’, Bennetts’s blueprints for the Parabot reveal a thrilling attention to detail. 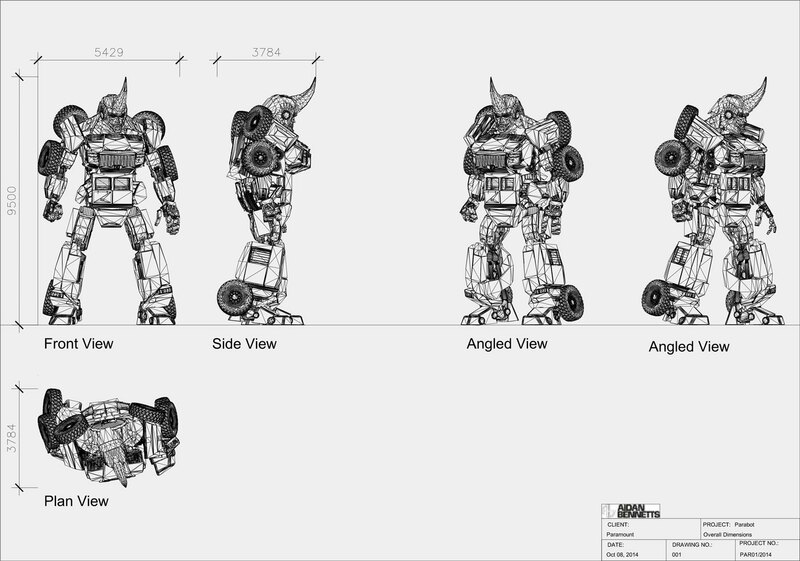 There are cogs and pistons and other pneumatic components, as well as a rhinoceros-like retractable horn and an infra-red camera mounted within the Parabot’s left eye. The powerful robotic hands seem capable of dexterous movement, and the overall impression is of a feasible and formidable cybernetic ‘warrior of the future’. The building of the exhibition project design began with the construction of a metal exoskeleton containing some simple internal elements. Clad on top of that, lightweight polyurethane foam and fibreglass were used to create the features of the Parabot (such as its humanoid face and its Humvee-style tyres),while some real design elements, such as grilles and headlights, were incorporated to deepen the realism of the hulking figure. Notwithstanding Bennetts’s minimalist approach to the construction of the model of the cyborg, the Parabot still weighed in at about four tonnes and cut a highly impressive figure as it towered over the other military vehicles and equipment on show at the 2014 AAD Expo. At over ten metres in height, it required steel struts to help it stand, but the Parabot’s pose – at once imperious and alert – seemed to suggest the potential for movement and devastating action. Interest in social media was significant – especially for what is usually a rather niche and specialised event – with the hashtag ‘Parabot’ trending across all platforms and thrusting the work of the Paramount Group into the public domain in an exciting and unforgettable fashion. Indeed, the Parabot proved so popular that it enjoyed road show tours to Jordan, Dubai and London, as well as being toured around South Africa in partnership with the Ichikowitz Family Foundation as a potent symbol of the country’s resistance to wildlife poaching. The model’s uncompromising demeanour and its embodiment of rugged defensive technology struck a chord with South Africans, who had begun to feel helpless about protecting their natural assets. Thousands of members of the public were encouraged to contribute to a conservation fund in support of South Africa’s national parks, and to join the awareness campaign by taking selfies with the Parabot. The Parabot made a triumphant return to the 2016 edition of the AAD Expo, once again dominating the apron and stealing the attention of both the delegates at the conference and the wider world of social media. This time, its head had been fixed on top of a gimbal that allowed it to slowly rotate, as if surveying the crowds that gathered to appraise the military hardware on show. Although it is now retired, the Parabot leaves a striking exhibition legacy behind, showing the power of integrated and innovative project design. By using the popular Transformers trope as a vehicle to promote the ideas of technological advancement and resolute defensive strength, Aidan Bennetts was able to create an installation that not only keyed into the Paramount Group’s core values and stated vision for the Expo, but also succeeded in igniting the imagination of everyone who saw it.